The gate lodge to 'Leahead', designed by A.S. Bell for the Henry W.J. Bucknall estate in Glen Cove. Bucknall was vice-president of the Armstrong Cork Company and a partner in Gudewill & Bucknall and Bucknall, Scholtz & Company, both cork importers. 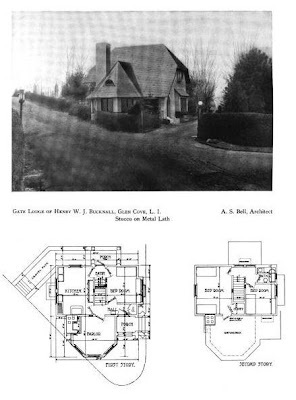 The gate lodge still stands, click HERE to see what it looks like today and click HERE to see where 'Leahead' would have stood on google earth. Picture from Concrete Houses & Cottages, 1909. Zach, do you know where Red Spring colony is located in GC? The layout reminds me of the gate lodge Pope did for Deepdale in 1906. Do you know when it was built? The picture was published in 1909 by the Atlas Portland Cement Company in their book 'Concrete Houses & Cottages'. Bucknall's neighbor to the south was J.R. Maxwell, president of the Atlas Portland Cement Company. I want to thank HalfPuddingHalfSauce for providing the current day picture. My great-grandfather was a csretaker for the Red Spring Colony. I will look today for the pictures, we have tons! My family would drive out from Brooklyn and Queens to visit him as if it was a vacation destination for them. I am the grandson of Henry W J Bucknall and live in Devon, England. I have quite a number of photos of Leahead, which incidentally he named after the English ancestral home of the Bucknalls in Staffordshire. let me know if you would like any further photos. Tim we would love to see them. You can email me at oldlongisland@gmail.com if you'd like. Thanks! Hello, I am the owner of the gate house, and am very interested in its history. We are undergoing renovations, we would appreciate photos in order to maintain and preserve it.